EINHELL have been doing daily Do-It-Yourself tasks for over 50 years across a broad spectrum of home and garden jobs. They’ve bought with them the technology and innovation of professional power tools, into the hands of the everyday DIY enthusiast. The range covers almost every type of tool you would expect to find in a Pro’s tool box but they come with a much smaller price tag. These include: Cordless Screwdrivers, Impact Drivers, Rotary Hammers, Stationary Tools and many, many more. 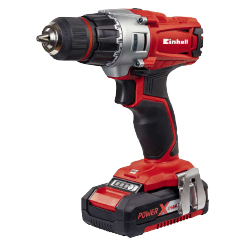 Not missing a trick in the cordless market, EINHELL have recently introduced a clever Power X-Change cross-product battery system. The benefit to the user mean you can stay loyal with the brand and expand your collection across their ever-growing garden range. Not convinced? How about an extended warranty and a 100% satisfaction policy? Einhell’s confidence in themselves grows as much as their ideas of where to take the brand next. So, what isn’t to love about EINHELL? Shop today and get it done well.